September 2nd at Cuffern manor, near Simpsons Cross. To the manor for fire, feast and folk September 2nd A CORNUCOPIA of delights awaits at Cuffern Manor in September. This year we are delighted to announce the return of this one day event promising fine food and drink, plus a great line up of musicians. 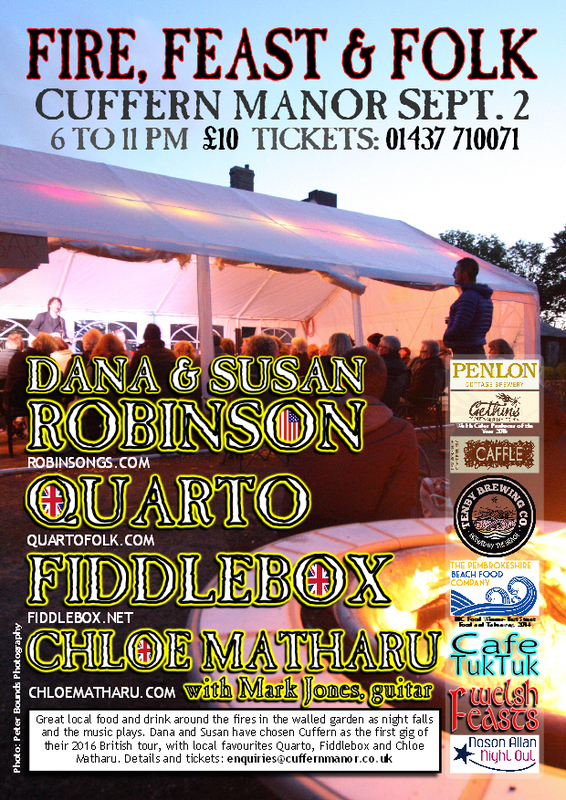 Headlining this year are American duo Dana and Susan Robinson who will be kicking off their 2016 UK tour at Cuffern. Also on the bill are local four-piece Quarto, whose recent CD release Lovers, Soldiers and the Tramp received airtime on BBC Radio Wales, well-known local duo Fiddlebox and Scotland/ Pembrokeshire based folk singer Chloe Matharu. Fine food and drink from local suppliers will be available on the evening. Tickets are £10 from Cuffern Manor on 01437 710071.